Madras boys basketball beats all Central Oregon teams in 1919; tries to secure championship. One of the most exciting basketball games of the season was staged last Saturday night at the Athletic Club Hall, when the Prineville and Madras High School teams tangled in a well-fought match. The Prineville boys came over with a loyal bunch of rooters with an avowed intention of "taking home the bacon," but alas, they met with a sad disappointment. The Madras boys had some intentions along that line themselves and being able to display a superior grade of skill in tossing the pig skin, succeeded in defeating the Prineville boys to the tune of 34 to 15. The Madras team is making a strenuous effort to secure the championship of Central Oregon and if they are able to maintain their past record, the desired goal will be easy of accomplishment as they have won three straight games, having defeated Bend, Redmond and Prineville. The boys are deserving of the support of the home fans and the enthusiasm displayed at the game Saturday night would indicate that they have it in large chunks. The training program at the Prineville airport was halted suddenly last week along with the same service in many other localities. 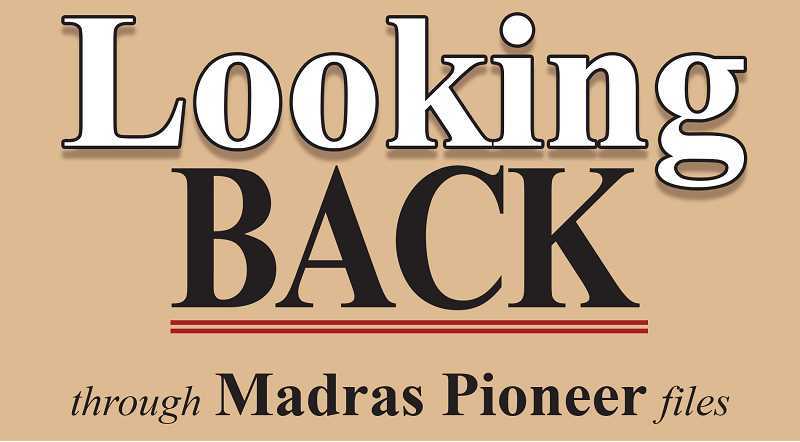 The service, operated by the Portland Flying Service, since a year ago, was in Madras for a time before the Army took over here and the present modern airport was put into operation. There seems to be no explanation for the sudden stopping of the training service. Just what will happen to the many men now in the training program is not known; these students are all from the enlisted reserve. The Madras airport has been working on limited basis for a time and just what will happen is not known. There are several current reports, one of which is that the field will be used for pursuit training soon and that there will be 1,500 flyers quartered there. We are not vouching for this story, though it could be possible. At present, there is only a working crew there, but it seems apparent that there is a change in evidence and more activity can be expected before many weeks. A new athletic code to govern the behavior of Madras High School athletes was presented to the board by athletic director designate, Rich Correa. The new code differs in many respects from the present policy and among its stipulations are several that brought board comment. Under the new code, it will be required that a parent or guardian must attend a meeting explaining the responsibilities and training policies of the Madras High athlete. Two meetings per sport season will be held according to the code, one in Madras and one in Warm Springs. The code also provides that if the parent cannot for some reason attend a meeting the athletic director will arrange a personal meeting. Lights for the Madras High School field were discussed with local PP&L manager John Mooney, who provided the board with a detailed estimate of costs relative types of lights and types of hookup available. It was mentioned by high school principal Stan Dmytryk that Madras High is the only team in their league without lights and that this situation causes problems in scheduling. The question of whether the public would prefer Friday night games vs. Saturday afternoon was discussed by the board and it was decided that prior to any action on the question, a poll of sorts should be undertaken to evaluate public preference. Within hours of experiencing last Monday's devastating Los Angeles earthquake, which measured 6.6 on the Richter scale and killed at least 27 people, Madras residents Jennifer Hatfield and Tammy Relling picked their way through broken glass and debris and went back to work buying spring and summer clothing for the local Hatfield's Department Store. "Initially, we were terrified and wondered if we were going to live. But after we lived through it, it was like 'Well, we're here so we might as well carry on,'" Hatfield related. The pair had left Saturday for a buying trip at a Los Angeles fashion market, which featured around 2,000 exhibitors. Hatfield's sister-in-law was also visiting the Los Angeles area and said she had been warned of the earthquake. "She had met a lady telling everyone to buy a gallon of water because something was going to happen," Hatfield said. After two successful days at the market, the women were asleep in their hotel room in downtown Los Angeles when the earthquake struck at 4:30 a.m.
"There was a loud noise and the room began shaking. It lasted 30 seconds but felt more like half an hour," Relling said, noting they were on the ninth floor of the hotel. "The noise was like a rattle and roll of a freight train. It was bouncy at the beginning and more of a swaying motion later. It was an eerie feeling with the walls rattling," Hatfield said. As the quake subsided, Relling remembered hearing sirens, a helicopter with search lights and people yelling in the streets. "We didn't know what to do. There was no power and no radio. We didn't get to a phone until 10 a.m.," Hatfield said. "Actually, not having radio and TV for 10 hours was a benefit. If we'd have known how bad it was, we would have been stressed," Hatfield remarked. Some people from the hotel went out to the multi-level parking garage and sat in their cars to listen to the radio, which they later found out was the worst thing safety-wise to do. When they finally reached relatives in Oregon, the women said they were able to find out a lot more about what was happening than when they were at the actual scene. Relling's relatives had been frantically trying to reach her to see if she was all right. Finally Jennifer got through on the phone. "I called John (Hatfield) and we decided we might as well stick it out, since we couldn't get very good flight connections," she said, admitting the decision seemed humorous now, but at the time they didn't feel panicked or in imminent danger. "When we came back and heard on the news how dramatic it was, it was more scary," Relling agreed.